Joomla! 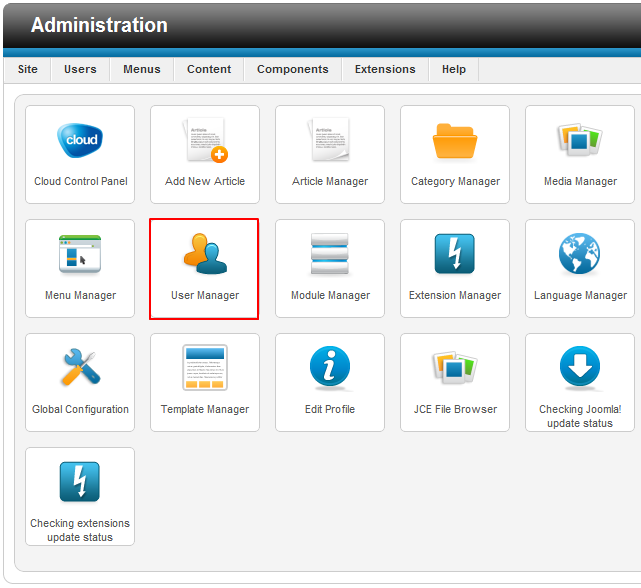 allows site administrators to place Users into multiple Groups. 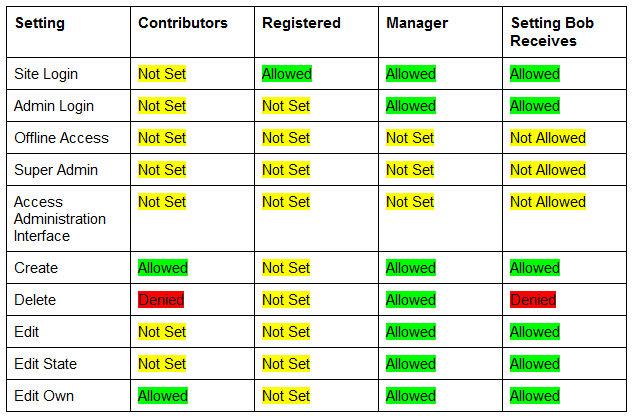 This article explains that Permissions are applied to Groups and not to individual Users. Thus, a User receives Permissions based on the Group or Groups that he or she belongs to. If a User is placed into one User Group, that User only has the Permissions belonging to that group. It s a simple concept. However, it is less clear when the User is a member of multiple Groups. This article explains how Permissions are assigned to a user that is a member of multiple Groups, as well as how to view the Permissions that are assigned to an individual User. As explained earlier in this series of articles, Permissions in Joomla! can be set to one of three settings: Not Set, Allowed, and Denied. The "Allowed" settings grant that Permission, and the"Not Set" and "Denied" settings take away Permission. But what happens when a User is assigned to two or more groups and Permissions in one Group are set differently than they are in the other Group? In that scenario, the "Allowed" setting will override the "Not Set" setting, and the "Denied" setting will override both the "Allowed" and "Not Set" settings. To illustrate how this works, let’s create an example. Let’s say you have created a Group called Contributors which has the Create and Edit Own permissions set to "Allowed", the Delete permission set to "Denied", and all other Permissions set to "Not Set". You have also created a user named Bob, and placed him into the Contributors and Registered Groups. The Registered Group is a preset group within your Joomla! application. It has the Site Login Permission set to "Allowed", and all other Permissions set to "Not Set". With this setup, Bob will receive the Site Login, Create, and Edit Own Permissions. As you can see, figuring out which Permissions have been given to an individual User that is in multiple Groups can become difficult rather quickly. To make things a bit easier, Joomla! includes a built-in tool to view all of the Permissions that have been assigned to an individual User. 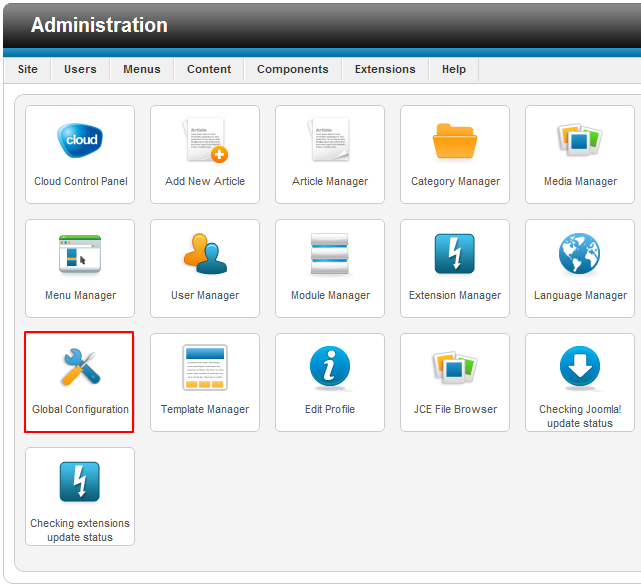 To turn this feature on, go to Global Configuration are from the control panel in the Administration area (the back end) of your site. Go to the System tab, and enable the Debug System option by clicking on "Yes". Be sure to save your work when you re done. Next, go to the User Manager. Once inside the User Manager, you ll notice a Debug Permissions Report button next to each Username. You will also see this button next to each Group in the Group Manager. The Debug Permissions Report will show you which Permissions that User or Group has for each area of your site including Articles, Categories, Contacts, Menus and Menu Items, Modules, and Components. Now that we have added the CSS and JS files to the Joomla 3.0 template that we are creating, we will now add the Necessary bootstrap files. After editing our template's index.php on the server and saving the changes, our template is taking a little more form. You can see in the screenshots below how our template looks with and without this css file. Professional web hosting provider – ASPHostPortal.com proudly announced the integration of the latest Web Deploy 3.5 in all web hosting plans. We are the first few hosting company that provide ASP.NET hosting plan that support the brand new Web Deploy 3.5 Hosting. Load Balancer Support with Session Affinity. Seamless integration with IIS Manager (IIS7 and above), Visual Studio (2010 and above) for creating packages and deploying them onto a machine, both locally and remotely. Integration with WebMatrix for deploying and downloading web applications. Seamless integration with the Web Platform Installer to install community web applications simply and easily. Web application packaging and deployment. Web server migration and synchronization. Automatic backup of Web Sites before making any changes. In addition to the IIS Manager, Visual Studio 10, Web Matrix tasks can be performed using the command-line, PowerShell Cmdlets or public APIs. According to ASPHostPortal.com, it's Web Deploy 3.5 offerings are distinguished by their low cost, with many of the hosting services supporting the technology being of the more expensive variety.